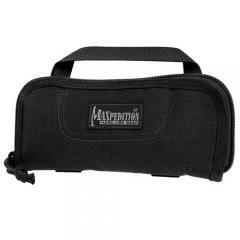 The Maxpedition R7 RazorShell cases are designed to protect everyday carry knives, but their premium level of protection serves to make them a choice shell for transporting small, fragile items. Impact-resistant, closed-cell foam absorbs shock and safeguards valuables from damage during transit, while a set of internal elastic bands prevent contents from shifting. Each case is lined with dual layers of soft, non-absorbent faux shearling that prevents scratching to weapon's finishes or electronic device screens. The RazorShell's exterior includes additional elastic bands for attaching a sheath or other accessories. The case securely closes with a durable YKK-10 zipper, complete with paracord pulls. The R7's heavy-duty carry handle allows for comfortable carry. Fits: Folding knives, watches, sunglasses, small electronics/devices, etc.